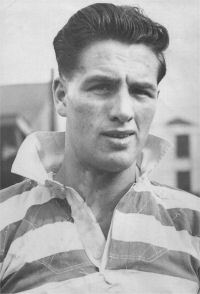 Eric Ashton joined Wigan in July 1955 having been spotted playing an army game whilst on National Service in Scotland and was offered a trial. He attended the trial and was seen by the directors at Wigan as being a player with exceptional talent, after Wigan offered him a spot in their top level side Ashton offered his home town club St. Helens the chance to sign him but they passed and he then signed for Wigan in 1955 for £150. Eric stated that he joined Wigan after his Saints turned him down because they were "the name" in Rugby League. Eric immediately made his debut in the opening match of the 1955-56 season against Dewsbury at Central Park - and what a debut! He scored 2 tries and 4 goals in a 52-5 win - but that feat was overshadowed by Billy Boston who scored 7 tries. Ashton will be remembered for his sublime partnership with Billy Boston during his Wigan career but in his first season at club Ashton didn't actually partner Boston - he was on the opposite centre-wing alongside David Bolton. He still managed to be second top try scorer (behind Boston) with 20 tries from 33 appearances although Wigan missed out on a top 4 play off place by 1 position. At the start of 1956-57 Ashton again began the season by partnering David Bolton but in an October away match a Leigh a decision was made to swap Ashton and fellow centre Jack Broome around - and thus the Boston, Ashton combination was born. It would be continue on and off for the next 11 years. Ashton again finished the year as second top try scorer with 18 tries which was only a mere 32 less than the great Boston. Eric also kicked 93 goals but despite these feats Wigan again missed out on the play offs - finishing sixth. In 1957-58 the Ashton - Boston partnership began to reek havoc as they scored a massive 78 tries between them - although this was still not enough to get Wigan into the play offs. However Ashton would lift his first trophy as Wigan triumphed at Wembley in a 13-9 win over Workington. 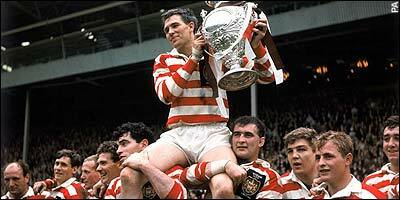 In 1958-59 Ashton again lifted the Challenge Cup as Wigan beat Hull 30-13 and the club finally made the play offs by finishing second but unfortunately they fell a the first hurdle - losing to Hunslet at Central Park. In the 1959-60 season Wigan finally won the league title. They had to do it the hard way having finished in only fourth position - which meant an away play off semi final at the league leaders. It was bitter rivals St Helens who had finished top and with them having won the championship the season before and having beaten Wigan home & away during the regular season - the task looked daunting. But Wigan beat Saints 19-9 at Knowsley Road to set up a Championship (Grand) Final with Wakefield. The final was held at Odsal and like St Helens, Wakefield had beaten Wigan on both occasions during the regular season. Trinity had hammered Hull 37-5 the semis and were massive favourites to win the title. But with 83,000 in attendance Wigan had other ideas. I'm not sure too many would have predicted the 27-3 scoreline that Wigan dished out but it was the Ashton - Boston combination that did most of the damage as they scored two tries apiece - although Ashton actually played at Stand Off in the final with Mick Sullivan having been suspended for a fight with Alex Murphy in the semi. In this title success Ashton contributed 24 tries in 35 appearances and also weighed in with 64 goals. So on the back of 2 challenge cups and 1 league title in the previous 3 seasons, Wigan went into 1960-61 with hope of winning more silverware. Ashton and Boston again continued to cause all sorts of problems for opposition defences. In an opening day 44-0 win over Barrow they scored 7 tries between them. Wigan were always in play off contention but missed out in the end by finishing 5th. St Helens were the club who denied them and to rub salt into the already open wounds Saints beat us 12-6 at Wembley. Ashton had again had a good year scoring 20 tries in 27 appearances but being denied twice by Saints left a bitter taste in the mouth. Joe Egan, who had been coach since 1956, resigned after the Wembley defeat and was replaced by Jim Sullivan who was returning for a second spell as coach. However just two months into his return, and very early on in the season, he fell ill and Johnny Lawrenson had to take over as caretaker. Ashton assisted Lawrenson during this time but it soon became clear Sullivan was not fit to return and Griff Jenkins became coach in October 1961. Despite the coaching uncertainty Wigan began 1961-62 in great style by winning 21 of their opening 22 matches - although Saints again would be a thorn in their side as they knocked them out of the Lancashire Cup. On the back of the great start Wigan would finish the season top of the table on points difference from Wakefield but they fell to Huddersfield in the play off semis losing 13-11 at Central Park. Ashton though as ever had played his part with 24 tries in 40 appearances. 1962-63 saw the league split into two divisions and Wigan had a poor year finishing a lowly 8th. It was a season that was affected badly by "the big freeze" which brought Heavy Snow and postponed most Rugby League matches for 2 and half months. Wigan went from 22nd December to 7th March (76 days) without playing a game and they struggled at the back end of the season when the fixtures piled up - winning just 7 of the last 17 matches. They did however reach Wembley again but lost 25-10 to Wakefield. A big part in Wigan's struggle was the absence of Billy Boston who missed most of the season. Ashton scored just 11 tries in 32 matches. Very early on in 1963-64 Griff Jenkins resigned and having assisted Johnny Lawrenson during Jim Sullivan's illness Ashton was offered the job of player-coach at Wigan. He accepted and Wigan's league form improved on the back of the signing of winger Trevor Lake. Billy Boston was still a formidable winger to face but his extraordinary try scoring exploits were beginning to scale down somewhat as he got older. Ashton weighed in with 14 tries from 33 appearances as Wigan finished 2nd behind Swinton but their were no play offs under a 2 division format so it meant nothing in the end. 1964-65 saw the two divisions merge back into one division and instead of a top 4 play off - a top 16 system was introduced. Wigan finished 2nd behind eventual champions St Helens but fell in Round 1 of the play offs to 15th placed Featherstone - who won 15-8 at Central Park. Wigan though had the comfort of having reached Wembley where they would meet Hunslet in what was a thrilling final. Wigan won 20-16 which resulted in Ashton lifting his third Challenge Cup. He only scored 10 tries in his 39 appearances in that year though. The following year Wigan again had a decent league campaign - finishing 3rd - and did better in the play offs defeating Widnes and Leeds on route to the semi finals. But they were denied a place in the Championship Final as Halifax beat them 25-12 at Central Park. Wigan again reached Wembley but played abysmally as Saints hammered them 21-2. It took 1989 to avenge that sorry loss! Ashton scored 9 in 39 appearances that year. One trophy that had denied Ashton throughout his Wigan career was the Lancashire Cup but he put that right in season 1966-67. On route to the final Wigan knocked out Leigh, Saints and Warrington to set up a clash with Oldham. The final was held at Station Road, Swinton and a try from Ashton proved crucial as Wigan came out 16-13 winners. The league campaign was very disappointing as Wigan finished 17th - there lowest finishing position ever. They struggled as Trevor Lake left the club following the Lancashire Cup Final and Billy Boston, despite still finishing top try scorer, was now at the veteran stage of his career and had lost the speed that made him so lethal. Ashton was still a regular in the side but his try scoring exploits were dwindling. He scored 8 tries in his 34 appearances. In 1967-68 Wigan again struggled to finish in just 11th place and although they battled past trips to Bradford and Leeds to reach the play off semi finals they eventually lost away at Wakefield. They were also denied in the semi finals of the Challenge Cup with a disappointing 25-4 defeat to Leeds. The year ended on a sad note as the great Boston announced his retirement after suffering a serious arm injury - although he did briefly later return to play for Blackpool. Ashton played 34 times in this campaign and crossed the whitewash on 12 occasions. Wigan's fortunes improved in 1968-69. They finished 3rd in the league and claimed silverware in the form of the BBC 2 Floodlit Trophy. The final was held at Central Park and the success was sweetened as it was Saints who they beat to win it, 7-4. Wigan lost in Round 2 of the play offs and after the game, in which they lost 26-21 to Salford, Ashton announced his retirement. He finished as he began by scoring a try in that final game. Despite the early play off exit after two disappointing seasons it was deemed to be a good year for the club. Ashton still played his part on the pitch - he played 32 times and scored 8 tries. Having retired from playing Ashton continued on as coach of Wigan until eventually resigning at the end of 1972-73. He coached Wigan to Lancashire Cup success in 1969-70 but they lost to Castleford at Wembley and fell out of the play offs at the first hurdle. A year later Wigan made it to the Championship Final in what will be remembered by Wigan fans as the one that got away. They held a 12-6 lead with 4 minutes to go but two late converted tries saw them lose the final 16-12 - and to make matters worse it was the Saints! Wigan again won the Lancashire cup in 1971-72 and finished 4th in the league but they got eliminated from the play offs early. Ashton's last season at the club was the year Wigan celebrated its centenary. At the end of the 1972-73 campaign the league would again split into two divisions with the top 16 of 30 forming Division 1. It seemed a simple task to finish in the top 16 but in the end Wigan finished 16th - only making Division 1 on points difference from York. At the end of the year Ashton resigned as coach and it was the end of a brilliant Wigan career. May have been a bit of ill-feeling at the time though because he went on to coach St Helens to league and cup success and eventually joined the board and briefly became chairman and was a a life president of Saints Despite this though he will forever be remember as a true Wigan legend. Far too young to have witnessed him myself but his honours and records with us tell you all you need to know. Eric sadly passed away aged 73 on March 20th 2008 after a long battle against cancer.